Born 1960 in Tokyo, Japan. Graduated from the Department of Architecture in the Faculty of Engineering at the University of Tokyo (UTokyo) in 1985. Completed a masterʼs degree at the School of Engineering at UTokyo in 1987. Worked at Nihon Sekkei from 1987 to 1993. Assistant in the Campus Planning Office of UTokyo from 1993 to 1996. Partner of Factor N Associates from 1993 to 2001. Teaching assistant of the Tadao Ando Lab in the Department of Architecture in the School of Engineering at UTokyo from 1998 to 2001. Established Chiba Manabu Architects in 2001. 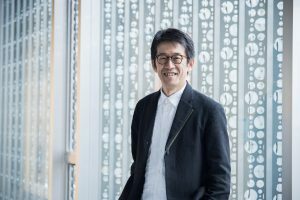 Associate professor in the Department of Architecture in the School of Engineering at UTokyo from 2001 to 2013. Visiting professor at the Swiss Federal Institute of Technology Zurich (ETH Zurich) from 2009 to 2010. Professor in the Department of Architecture in the School of Engineering at UTokyo since 2013. Vice president of UTokyo since 2016.